We deliver and assemble customised wooden constructions and outdoor buildings in consultation with the client. Therefore, you do not have to worry about a thing. 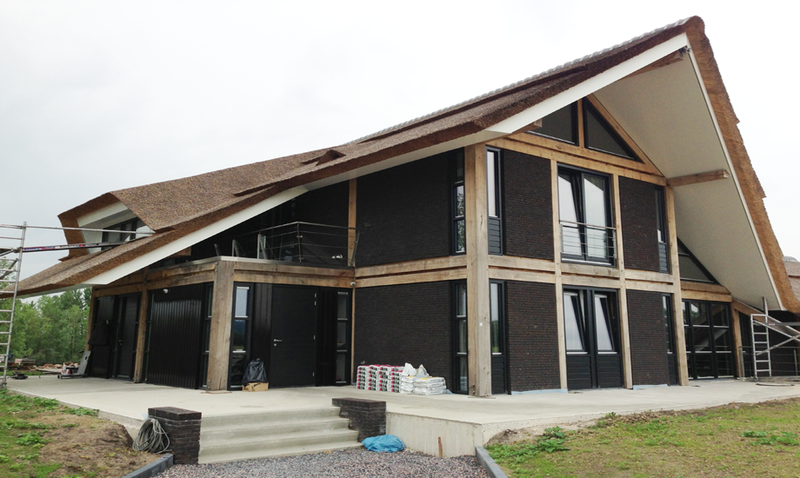 But if you like to work with wood and build constructions, we can also deliver the wood as a prefab assembly package. The wood is processed with pin and hole and/or dovetail connections. 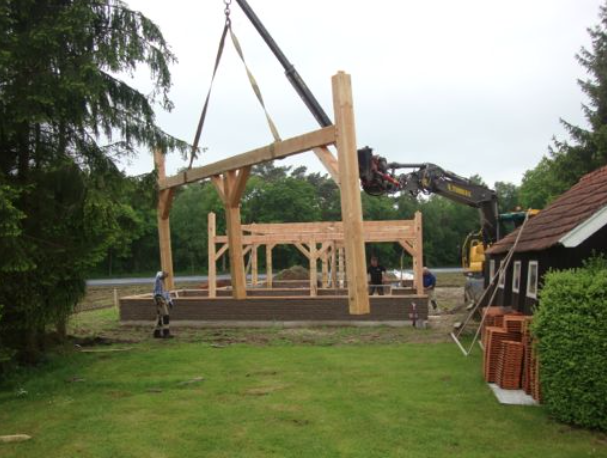 Most of our wooden constructions and outdoor buildings are made from untreated oak. After a while oak wood will turn from light yellow to light to dark grey. Especially in constructions that are subject to a lot of wind and sun, this colour clearly comes to light. Oak is a beautiful, contemporary and appropriate type of hardwood. It has an authentic, natural and rustic look. It also has the feature that it continues to work. Oak contains tannic acid and this will cause stains on the wood and pavement because of rain and snow. But these will disappear after a while. When in contact with iron the tannic acid will enter a reaction that will cause dark blue and black stains on the beams. However, these will also reduce after a while. Douglas is used by Oude Hengel as a good alternative for Oak. Douglas is by nature a very durable type of wood, especially when it is applied dry in the constructions. Douglas is lighter in weight and very strong and tough. The colour is pink and has more clear marking than Oak. Douglas is a frequently used type of wood in the Netherlands because of the easy processing, stability, little effect and the good price/quality ration. Our constructions and outdoor buildings are always customised designed and produced. The possibilities are unlimited. 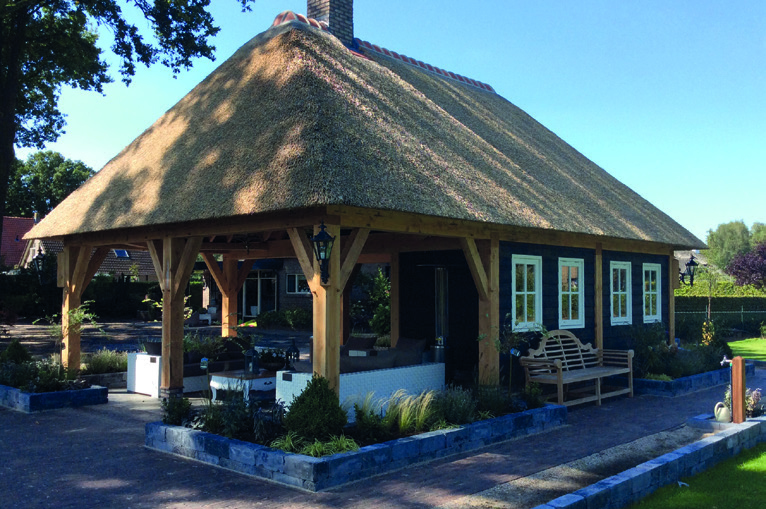 Regardless the weather, you can always enjoy the outdoors in the outdoor buildings from H. Oude Hengel GmbH. An outdoor building can be divided in a conservatory with two sliding doors, an area for the outdoor kitchen and possible a heater and a covered seating corner. It is like being on holiday in your own garden! Our impressions will show that there are plenty of possibilities. Together with your architect or client we discuss the requirements with you. We like to offer you a technical applicable proposal that matches your demand and requirement.